To remind Americans that nothing's too sacred for shameless corporate self-promotion, the King of Beers is currently seeking federal approval for a new label that would let it swap Budweiser with the word America. The Über-patriotic redo would just be for the summer, Ad Age reports. 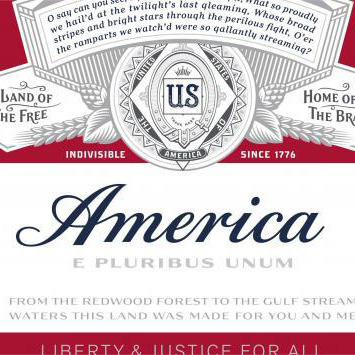 While there's no bald eagle, it does include other 'Murica must-haves like the lyrics to the entire national anthem and phrases like "E Pluribus Unum," "Liberty & Justice for All," and "Indivisible Since 1776," which, while true of the U.S., doesn't apply to Bud since the company's barely half that old. Maybe most hilarious, the seal up top that gloats about the beer's global reach (the words Europe, Australia, Asia, and Africa appear around the crest) now just reads "The United States of America," basically one-third of one continent. AB InBev's vice president of marketing told Ad Age that there is "this wave of patriotism that is going to go up and down throughout the summertime," and Budweiser sees no reason to sit there passively and watch that wave go by. The summer of 2016 in particular will give Americans lots of times to feel patriotic and therefore buy "America"-brand beer -- the Fourth of July, the Olympics, and (at least in Bud's mind) the Copa America soccer tournament. Also, it shouldn't discount the rallies this summer for a certain presidential candidate who could surely find a thematic use for a nationalist beer.